I just returned from an outstanding trip to Sydney, Australia. I worked with some great folks and evaluated many kids whose potential I can’t wait to help unlock. I also met with some great open-minded folks at the University of Sydney to discuss a research project with our Simply Smarter System and creating NACD courses for their continuing education programs. 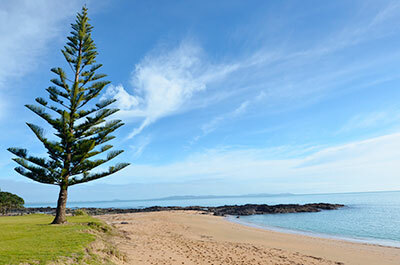 You might surmise from the title of this article that it has something to do with brains; but what is the link to Norfolk pines and what is a Norfolk pine? I have always thought that the little Norfolk pines that I would see in grocery stores around Christmas, overlooking the glitter they often put on them, were rather exotic and interesting. I had never had the time, opportunity, or actual inclination to investigate them; but I still found them to be curious little 18” plants, particularly since they were a species of pine tree. However, upon recent investigation, I discovered why I thought they were curious pines– they are not actually pine trees at all. Okay, lest you think I am having some kind of senior moment and running off on a tangent, let me start trying to connect some dots. While visiting Sydney we spent a weekend at Manly Beach, just outside of Sydney. Shortly after arriving, we went out to check out the sights. The beach and the area were really spectacular. We admired the beautiful sandy beach, watched the surfers, and started appraising the dozens of tempting restaurants. But some of the most prominent features of the area were these very spectacular, exotic hundred-plus-foot high evergreens that were everywhere. My son, Laird, wondered aloud what kind of trees they were, and I realized that I recognized them as huge specimens of those little plants with glitter–Norfolk pines. I decided that when I got home I needed to go find one of the 18-inch versions for my house and another for Laird and his wife to commemorate our trip to Australia. Fast-forward a couple of weeks. I’m back in the mountains of Utah, where we have many “real” pines and evergreens. I was home watching the news and dozing a bit when a commercial came on. I rarely pay any attention to commercials, with the exception of the occasional Jaguar commercial, and I really didn’t pay any attention to this one either, or so I thought. But actually, my brain did. Something in my peripheral vision caught my brain’s attention. I stopped the commercial and rewound it. I still couldn’t tell you what they were trying to sell, or why my brain said, “Hey, there was just something of significance;” but after I rewound the commercial, I discovered that in one very fleeting scene, as they were rapidly flashing across an office, there sitting on a shelf was a little potted Norfolk pine. But why did my brain react to that little piece of apparently-irrelevant data, when my sort-of-conscious brain was trying to contemplate what was behind Hillary Clinton’s missing email? The answer is simple: it could, so it did. Did you ever buy a new car and suddenly start seeing them everywhere? Did a few hundred thousand of them get produced and sold overnight, or did they just start occupying a more significant place in your brain? Could it be that as our brains add more and more importance to these pieces of information, and as we make more and more associations, particularly personal associations, that our brains, like magnets, gather more and more associated pieces? Could it also be that what we know, what is in our long-term memory, provides relevance and helps to determine what we do and do not perceive? That our short-term and working memories dictate how many of those pieces we can sequence and associate, thus determine how large and meaningful our world is? How connected we are to it? How tuned in we are, how significant it all is? How much we are learning? Yes it could be, and I believe it does. There is this great connection and loop between our short-term memory, our working memory, and our long-term memory. Our short-term memory determines how many sequential pieces of information we can process. Starting with a newborn, that number is zero and builds based on input/opportunity. The foundation of our working memory is our short-term memory. Our working memory refers to how many pieces we can manipulate and determines our complexity of thought. Together we call our short-term memory and working memory our processing power. What we process goes toward, and perhaps into, our long-term memory, based on the frequency, intensity and duration of the input and what is already in there. Our knowledge base determines what we actually process. And the more we process and the more we put into our brains, the more we stimulate the brain, the more we trigger neuroplasticity, grow connections, build networks, and literally grow our brains. The more we know, the more relevance new input has, the more our brains pay attention to it, and the more we take in, the better we process–it’s a loop. The brain is really very cool. The more you put into long-term memory, the more it can actually hold and the more it has in it, the more new input it attracts. The significance of this is that what we teach our child impacts the development of the short-term and working memory. If it is relevant and associated information, then it gets into long-term memory, and then in turn it adds relevance to additional new information and builds everything even further. The degree to which we impact the development of a child’s brain and build their neurological foundation (short-term memory, working memory, and long-term memory) is largely a reflection of how targeted our input is. Bad Scenario–You are in college, a freshman English Literature major. Things got screwed up and they placed you in some kind of crazy blow-your-mind advanced math class with a bunch of seniors. You hadn’t taken math since your junior year in high school and then hadn’t gone past Algebra II, which you hated. Saying that everything that went on in this class was over your head is an incredible understatement. The only things you would take from the class were a significantly lowered self-image, verification that you really stink at math, and a lower GPA. In this scenario the odds are that you had no real frame of reference for the material, nothing for your brain to associate/connect with; so what you had in your long-term memory did you no good at all. If you can, imagine a blackboard covered with formulas and figures that you need to process visually. Odds are that being an English Lit Major you are much better at processing auditory sequential information than visual, and that your visual processing probably was not up to the task. Net result: no increase in your auditory or visual short-term or working memory, and nothing added to your long-term memory other than a confirmation of your hatred for math. Neuroplasticity triggered—minimal. Brain change or growth—minimal. Good Scenario–You are still a freshman English Lit. major. You get invited to a small private dinner party at your favorite professor’s house to meet your favorite author. You have read everything this author has written, and you know your professor’s views on her work. At dinner, in this very intimate evening where you are treated as a peer, you have the opportunity to discuss this author’s novels and short stories and her new project. You take in every word as though it had the intensity of a bolt of lightening. Each bit you take in immediately associates with many hundreds and perhaps thousands of other related and associated bits and chunks of information. This was a targeted educational experience. Because it was so targeted for you, the strong auditory learner and conceptualizer who loves literature and who knew and loved the author and her work, your brain was changed. The experience added to your long-term memory/knowledge base, which in turn would then affect your brain’s ability to process future associated input. The targeted, and thus intense, input would have actually helped build your processing ability as well. Neuroplasticity triggered—immense. Brain change and growth—huge. These are moments you would perhaps recall for a lifetime. What are the implications of all of this? What affects, stimulates, and develops our brains is very specific and unique to each of us. We need targeted individualized educational opportunities to encourage neuro-development. The more individualized our education, the more it actually constitutes an opportunity. Random disassociated input does little to really change the brain. Sequential associated information makes an impression on the brain. How much we take in and learn and what gets into long-term memory is a refection of the strength of our neurological base, our short-term memory, working memory, and long-term memory. We needed targeted individualized opportunities to build our processing power, utilizing specific processing brain development activities, such as the Simply Smarter System, NACD Cognition Coach apps, and 1:1 processing activities. What we know of our world affects our processing and memory. It appears that our brain pays attention to what it can identify, what has meaning, and particularly to what it can name and the degree to which it can name it. Observing many thousands of children and trying to crawl into their brains, it appears that our brains do constantly react to, rehearse, and review based on opportunity. Simply being able to name those things that are in our daily world, I believe, helps build and develop our processing and helps keep information in our long-term memory. The more we learn, the more we can learn. Knowledge, information in long-term memory, produces more knowledge and increases what goes into long-term memory. As we learn and add to our long term memory, the more significant more things become, and the more our brains attention to and learn. Picture your long-term memory as a magnet, a magnet that grows and gets stronger with every new thing that it pulls in. The more you put in, the “smarter” you get, and the easier it is to get even smarter. What develops changes, and that which changes can be developed. If those involved with child development and education really understood this, this could be a game changer for everyone. What develops changes. Every child begins life not being able to even give meaning to a sound or an image, but learns and changes based on opportunity. Short-term memory develops. Working memory develops. Everything that develops through opportunity can be accelerated with more and better opportunities. And you can teach an old dog new tricks—if you try. I did find some little Norfolk pines. We have them in our homes, and I have no doubt that our memories of our trip to Australia will remain much longer now that we have our trees. Just a little P.S. : I’m presently in Los Angeles. I used to live here and I’ve been coming here regularly since the 70s. You will never guess what I was seeing all over the place this evening as I drove through rush hour traffic in Laurel Canyon. Norfolk pines! How amazing it is that during all those years my brain never determined that they were worth acknowledging. Once my brain could put a name to them and had established associations, they became significant. I think that’s very cool.